All transactions are safe and secure with a reliable history in online purchasing behind each of our associates. Buy the Gordon Gartrelle t-shirt to own Cosby Show clothing and merchandise. 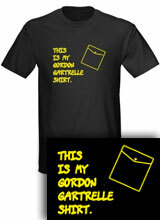 This Gordon Gartrelle t-shirt gives Denise's creative interpretation a run for its money. If you recall, Theo bought an original yellow and black GG with hidden buttons, a flap on the back, and two-tone pockets for his date with Christine. Unfortunately, when his parents find out he paid $95 for a Gordon Gartrelle original, he is forced to hand it over. Denise offers up her services as a novice seamstress to create a look-a-like. When it comes to the final hour, he finds out that things did not go smoothly. Luckily, his date still wants to go out with him and all is well as he introduces Denise as the true creator. In addition to the Gordon Gartrelle tee above, browse the Cosby Show Clothing Gallery for more apparel like men's and women's clothes, kids shirts or hoodies.